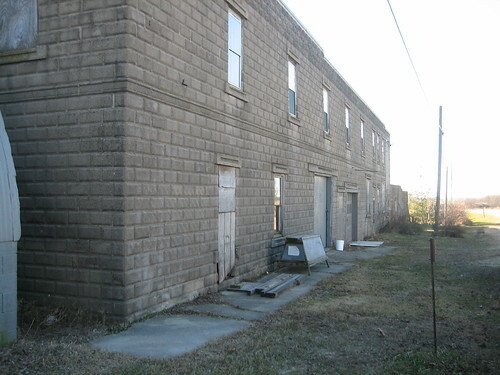 Posted by dr. gonzo in Architecture, History, Houses, National Register of Historic Places. After spending so much time near Chicago I thought it would be nice to return to the downstate calm of Old U.S. Route 66. 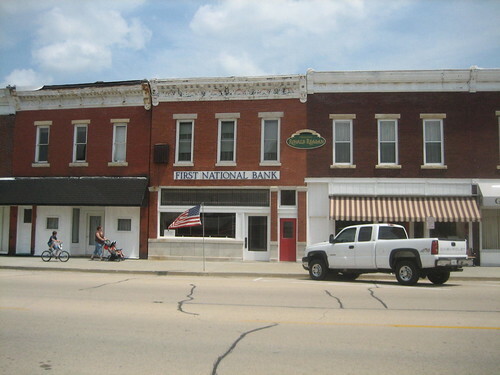 Just north of the city of Chenoa, Illinois, the historic section of U.S. Route 66 that is listed on the National Register Historic Places ends, but the road continues southward, toward Bloomington. 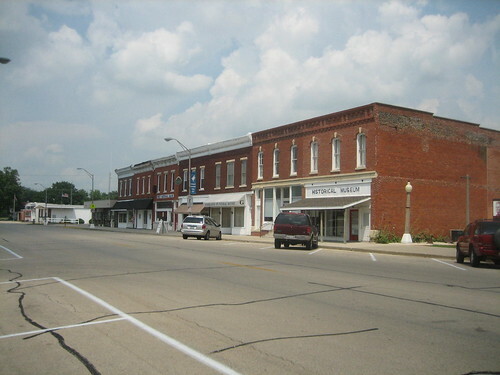 Coming from Pontiac, we first hit Chenoa, in northern McLean County. Posted by dr. gonzo in Architecture, Frank Lloyd Wright, Houses, National Historic Landmarks, Prairie style. The Arthur Heurtley House is a true architectural gems, besides being one of my favorite Frank Lloyd Wright buildings, it is a distinguished early example of Wright’s mastery of his new Prairie style. 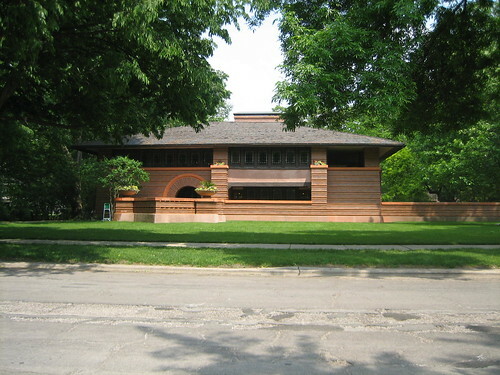 The Heurtley House is one of four National Historic Landmarks in Oak Park, Illinois – the others are Pleasant Home, Frank Lloyd Wright Home and Studio, and Unity Temple. 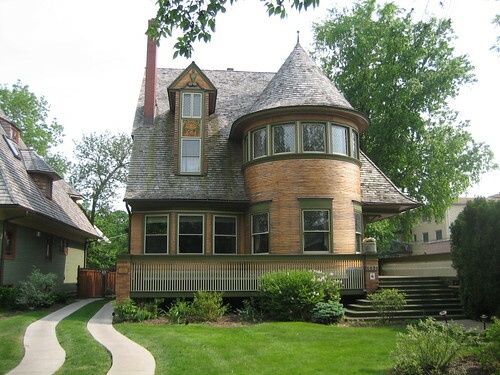 The 1902 Heurtley House is acknowledged as a critically important work of early modern architecture; one that the National Historic Landmark Program claims is the first fully mature example of Prairie School architecture. As we have seen, many sources dispute this claim, instead crediting the Frank W. Thomas House from one year earlier as the first full Prairie house. The emphasis on the Heurtley House is decidedly horizontal, its asymmetical front facade, hipped roof, massive chimney and horizontal character do provide a good comparison point for all things Prairie. Something I am sure could also be done with the Thomas House. 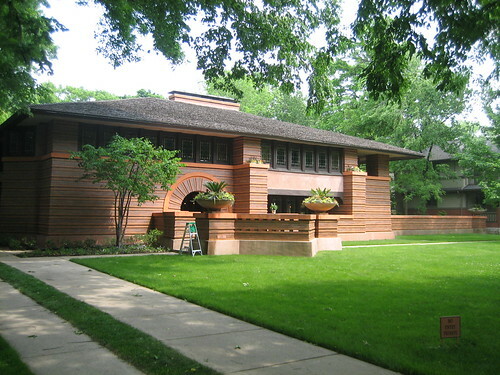 Before February 16, 2000, the Heurtley House was simply a member of the National Register of Historic Places listing for the Frank Lloyd Wright-Prairie School of Architecture Historic District. 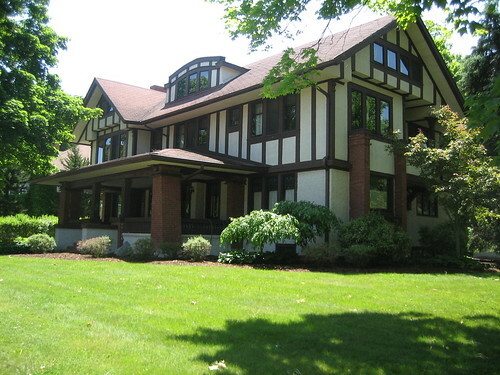 On that date, the home was declared a National Historic Landmark (NHL) because of its architectural importance. An NHL declaration garners an automatic listing on the National Register of Historic Places (NRHP), thus the Heurtley House was individually listed on the NRHP at the same time. There is more to say about the Heurtley House than you and I have time for here, but if this perks your interest in a house I adore, I suggest checking out the resources below, especially the NHL nomination form and the Illinois Historic Preservation Association (IHPA) Property Information Report. Posted by dr. gonzo in Architecture, Frank Lloyd Wright, Houses, National Register of Historic Places, Prairie style. There are two houses in Oak Park which have, at different times, been called the “first fully mature” example of a Frank Lloyd Wright Prairie style house. The first of those homes is the Frank W. Thomas House at 210 Forest Avenue; most sources agree that the Thomas House was the first example. Posted by dr. gonzo in Architecture, Frank Lloyd Wright, Houses, National Register of Historic Places. 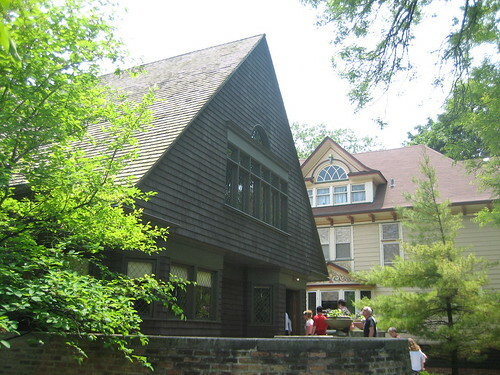 The Walter Gale House, in Oak Park, Illinois, was constructed around the time of yesterday’s Bootleg Houses and closely resembles their design. Again, Wright went with a geometric Queen Anne style that, while not unlike traditional styles popular during the 1890s, represented a precursor to the direction he would take a few years later. Between 1892 and 1893 Frank Lloyd Wright designed a series of eight houses, many of them similar in style, in and around Oak Park, Illinois. The popular tale says that Wright, then under contract with Louis Sullivan, was forbidden, by his contract, to “moonlight” and do independent designs. That tale is contradicted in Thomas Heinz’s 2006 book, “The Vision of Frank Lloyd Wright”. Heinz says that Wright was not forbidden to do independent work, and that Sullivan would have encouraged it because Wright owed him money. Heinz says Wright left Adler and Sullivan on his own terms, amidst an economic downturn. Posted by dr. gonzo in Architecture, Churches, Frank Lloyd Wright, National Historic Landmarks. Not far from the Pleasant Home is Unity Temple, another Oak Park National Historic Landmark that many consider one of the crowning achievements of American architect Frank Lloyd Wright. Unity Temple is the result of years of experimentation in Oak Park with various designs, from geometric Queen Anne style homes, to the first fully mature examples of Prairie style architecture. 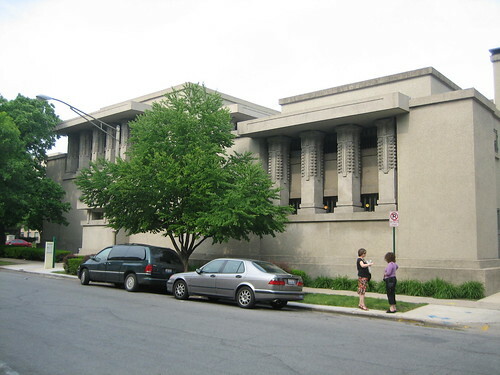 The Unity Temple is an impressive example of early modernism in architecture. Posted by dr. gonzo in Architecture, Houses, National Historic Landmarks, Prairie style. The last few days have been a breather, stopping here in DeKalb County. A short drive toward Chicago, though, and we are in, perhaps the most architecturally significant village in the United States, Oak Park, Illinois. 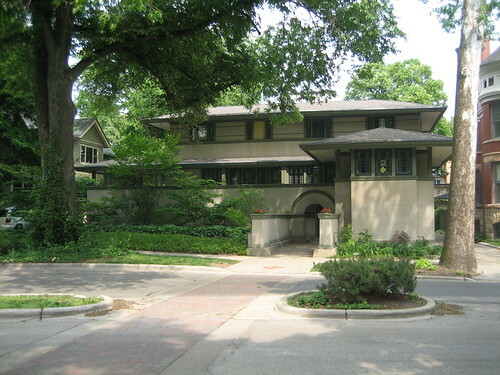 Oak Park is home to dozens of residential works by Frank Lloyd Wright, and other Prairie Style masters. But before we dive knee deep into Wright we must stop over and see an architect we talked about the other day, George W. Maher. Posted by dr. gonzo in Architecture, History, National Register of Historic Places. I have already discussed DeKalb, Illinois’ most obvious example of Prairie style architecture, the oft-mistaken for a Frank Lloyd Wright work A.O. Anderson House. While prominent it isn’t the only example of the style in the city. In fact, there are other examples of the style by architects much more well-known than John S. Van Bergen. Augusta Avenue is a good place to start, within a block of the Anderson House are two examples of architecture by a key Prairie architect. Weary from our journey we return to Sycamore suffering from a case of Republican-icon-overload. Breathe, sigh, we’re back and will be soothed. Soothed by picture perfect Italianate style. 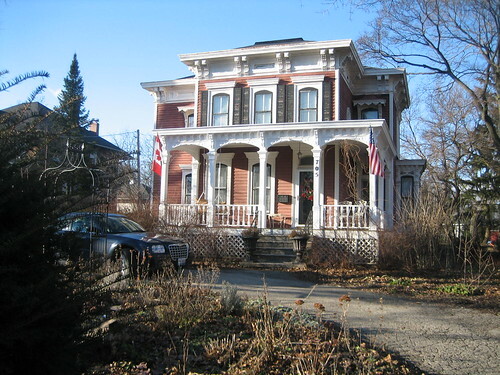 At 705 DeKalb Avenue in Sycamore is a high-style example of Italianate in the Adolphus W. Brower House. Today, Ronald Reagan was born in 1911. I have said before I am not a Republican nor a Reagan fan, but it is significant history for northern Illinois and needs to be talked about. Today we see the Ronald Reagan Birthplace building. He was born in the second floor apartment of a commercial building in downtown Tampico, Illinois. 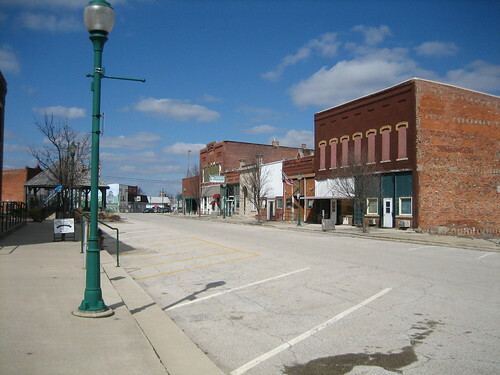 Before the Reagans came to Dixon they lived in the Whiteside County, Illinois village of Tampico. In fact, Ronald Reagan (40th U.S. President) was born there on February 6, 1911 (more on that tomorrow). 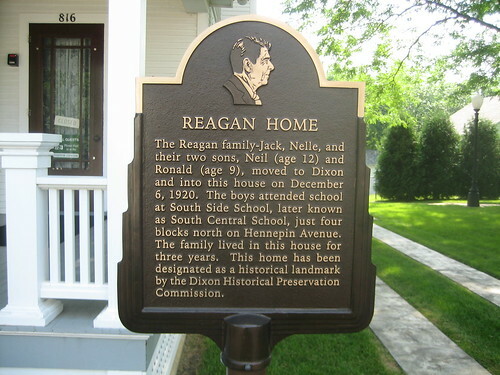 The area around the apartment where Reagan was born is a historic district, listed on the National Register of Historic Places in 1982. Ronald Reagan grew up and went to high school in Dixon, Illinois. 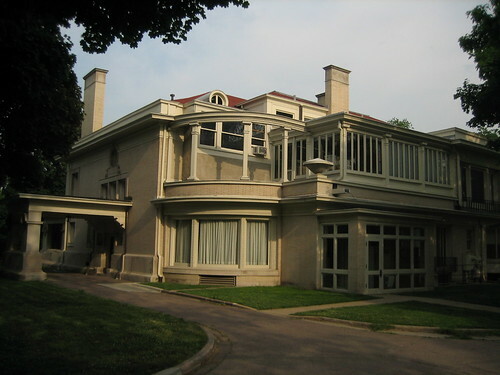 His family lived in a house on Hennepin Avenue (now Reagan Way) that gained federal recognition, first as a listing on the National Register of Historic Places in 1982, and then as a National Historic Site in 2002. While the building has been declared a National Historic Site, ownership has not been handed over to the National Park Service, a necessary step in its evolution to the new status. You will soon know why. Posted by dr. gonzo in Writing. To break up the monotony of my architecture posts (I hope you aren’t too bored with them, I love the stuff) I present to you a story I wrote for a short, short fiction contest. I never entered it because I have the guts of a snail sometimes. Thanks for reading.